It’s been a while since we’ve had a Mmmf post here, which is kind of a shame, since, food-wise, this winter has been largely about learning new recipes along with the usual seasonal culinary indulgences. To be honest, though, I’m relieved to be back to eating less decadently. [Except on the weekends, that is.] I have so much more energy and better braining power with less fat, starch and sugar in my system. Here is what my day-to-day provisions have looked like over the past few weeks. This isn’t everything, but it’s representative enough. Not pictured: protein bars, almonds, apples, soups, dark chocolate and lots of chai with coconut milk. 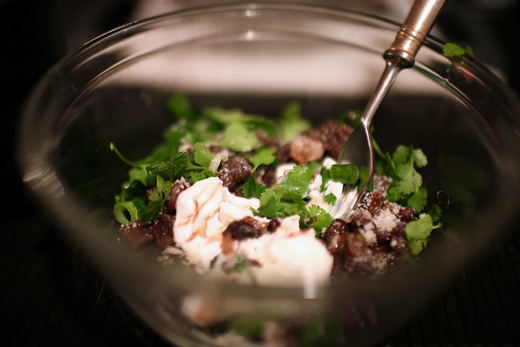 Spicy black beans and quinoa with cumin, sour cream and cilantro. 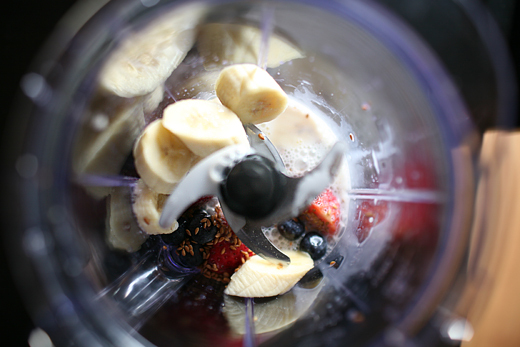 Soon-to-be-shake with almond milk, banana, strawberries, blueberries and flax seeds. 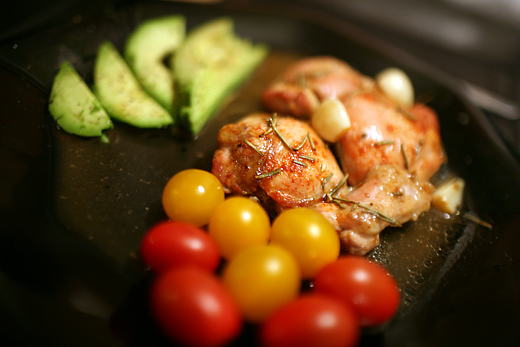 Roast skinless chicken thigh with sliced avocado and tomatoes. 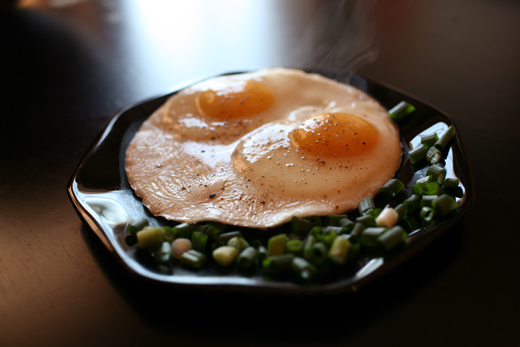 Two eggs sunny side up with green onions. 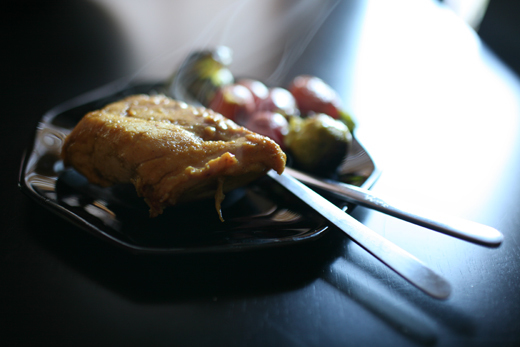 Curried chicken with roast brussels sprouts and radishes. 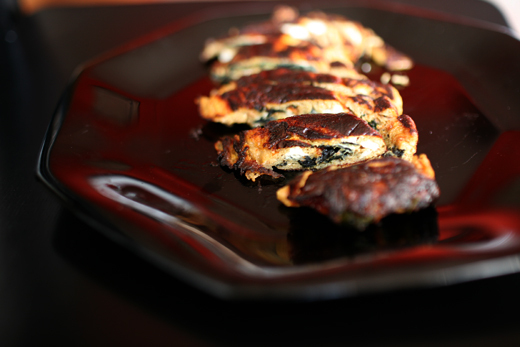 Fancy-pants rolled omelette with honey and seaweed. 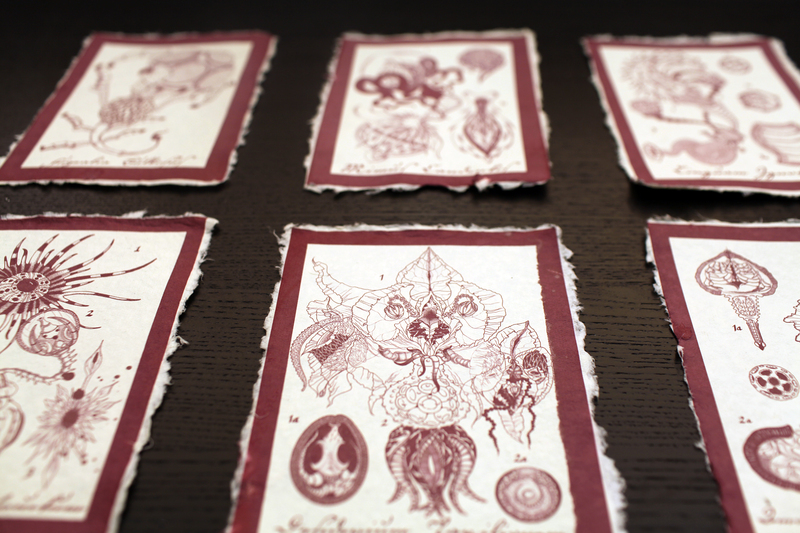 Mine is a slightly modified version of this. Hit the jump for the recipe! Heat up a small pan (preferably with high sides) on low-medium heat. Once the pan is hot, add about 2 tablespoons of vegetable or olive oil. Break the eggs into a small bowl, add the chili oil, honey, and soy sauce, and beat the eggs with a fork. When the oil in the pan is hot, pour half of the egg mixture into the pan. Swirl/Spread the egg around the pan so that it fills the bottom, and then sprinkle half of the seaweed over the egg. Let the under side of the egg slowly cook. Then, using a spatula (or even two spatulas), lift up a 1 inch portion of the egg and fold it over the top. Let the egg cook a little bit, and then repeat folding the egg, until it’s all rolled up. Push the rolled omelette back to the other side of the pan, and pour the rest of the egg in. Sprinkle the last of the seaweed onto the egg, and repeat step 4 using the already rolled egg as the inside. Let the rolled omelette slowly cook in the pan until the wider sides are nice and browned. Take the omelette out, and slice it into half inch slices. Mmf. What kind of protein bars do you like? I’ve been looking for a good one, but haven’t found a favorite yet. Yay! I love ‘Mmmmf’ posts. Delectable looking food, will be giving the fancy pants omelette a whirl, with peppers so it’s disco fancy pants omelette. omg O_O everything looks so tasty! I love the Mmmf posts. 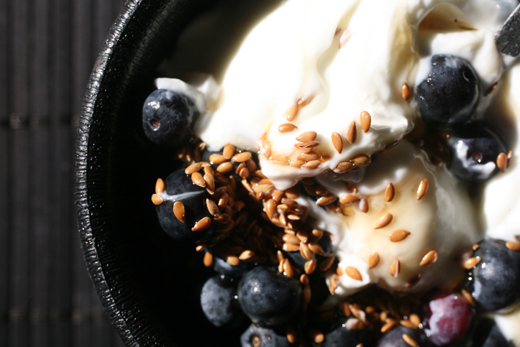 You always have such great food combos. Wow. I’ve gone full hippie. we need to have dinner together, end of story. Is that a Ninja food processor/blender I spy? I’d probably be lost without mine. Avocado shakes and protein drinks abound! Maehymn: My favorites right now are Think Thin in Creamy Peanut Butter. SO. GOOD. Siobhan – I, myself, am not a pepper fan for the most part, but I wish you lucks in your omeletty endeavors. Kakuidori and Heather – thank you! Agent Dinah – totally true. When I’m feeling lazy I just make sure to chew extra-thoroughly, but that’s probably insufficient. Selina – good eye! Our second one – love them so much. Even good for certain soups and salads. Awesome. I’ve seen those but haven’t tried them yet, so thanks for the rec! Whoa…..did you say you had roasted brussel sprouts with radishes? Radishes? You can roast those? Shitfire, I’ve been eating them raw my whole life. It never occured to me COOK them. For reals? What did you season them with before roasting?